Perfect descriptor of this goodness. One of the better photos in several months. Love the candour. I just scrolled through several shots starting from most recent and working back, but this is my favorite, thus far. Reminds me a bit of Chalky White from Boardwalk Empire. I love the classic look, but with a bit of fun, like the combination of prints here. A fantastic picture that appears almost as though you travelled back in time to take it. I like the classic look, and I love his hat! Yes, you said it very nicely. Perfect B&W photo. The patterns on his suit, the secenery… everything is just great. J’adore cette photo. On dirait les années 50. Sauf que c’est aujourd’hui. I love this pic. Smells like thé 50s, except that it is now. Oh how much I adore this picture! It would be impossible to pass this man without seeming like a total gawker or a spy. One waits months, or even YEARS to see a look as fine as this! 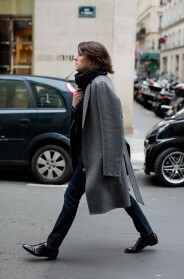 Good eye, Sartorialist! Scott, Ok so you find the photo of the girl in double plaid special because you were with McCurry. 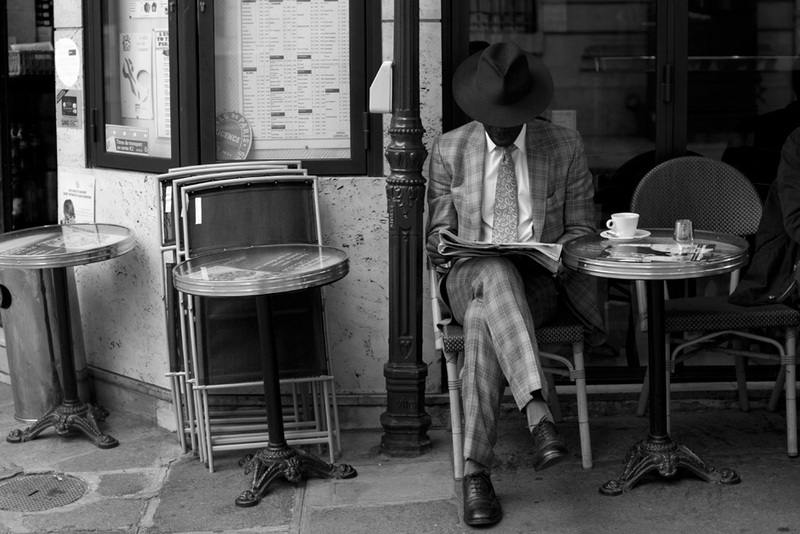 Itt is nice, but this b&w is a truly great photo..
could this be the same spot you took a photo of another gentleman, the one with the white shoes? Wonderful shot – love that we can’t see his face, just his style. great picture, such calm and simplicity. Oh! David McCallum in The Invisible Man! Yes I am that old ! could this be somewhere else apart from Paris??? I d really love to know if there is a coloured version of this photo … because the suit, the tie – what colours can we expect?? I absolutely love it when Scott decides a photo needs to be b&w. Absent color, the eye is drawn to composition, texture, light, and character. Wondering what color the guy’s suit is completely misses the point — I suspect Scott thought it would be a distraction. If the colors of the suit were vivid (which I suspect they were), most people would focus right on that and never see everything else that is wonderful about this photo. A color photo pretty much does it all for you — it’s a passive look-see. A b&w photo engages the imagination — make up your own story about this and paint it all the colors you want. Great capture! It seems taken from an old book! Beautiful pic. This man is an allegory for masculine elegance. What a lovely shot Scott. It can only be the Editor-in-Chief of Luxure Magazine, he always looks so sharp! this picture is simply a MASTERPIECE! I Love it??? ?